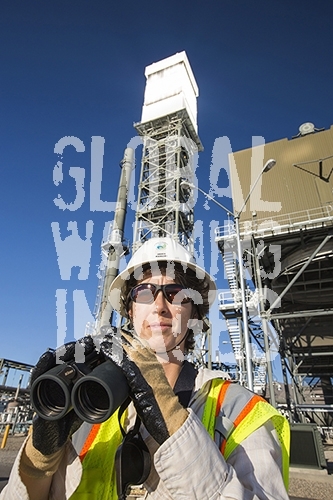 Andrea Wuenschel, one of 50 biologists working at The Ivanpah Solar Thermal Power Plant in California''s Mojave Desert. Ivanpah is currently the largest solar thermal plant in the world. It generates 392 megawatts (MW) and deploys 173,500 heliostats that reflect the suns rays onto three solar towers. It covers 4,000 acres of desert. Andrea is looking out for birds that might be flying close to the solar towers.